I promised an update on the office or master bedroom on Monday, but I've had a few unexpected delays... I hope I'll have something to share tomorrow and if not then - definitely next week! Y'all. Stop the presses. I have a very important decision to make and I need your help. *sarcasm alert* Our trash can step mechanism broke over the weekend and it looks like there's no fixing it, so we're in the market for a new one. You might be saying to yourself, "Are we really talking trash cans today, Chaney?" And my response would be yes, yes. we. are. If you live in a house - I presume most of you have a roof of some sort over your heads - you know how much of a difference a good trash can can make. Am I right? We've had a simplehuman one for the past 5ish years and it has served us well, but it finally bit the dust. I started looking at trash cans a couple of days ago and - dang - trash cans can be expensive! I would really rather not spend $100+ on one, but many of the best-rated ones are at least that much. I pulled together a list of contenders (apologies for the bias toward simplehuman...they just make a lot of good ones!) 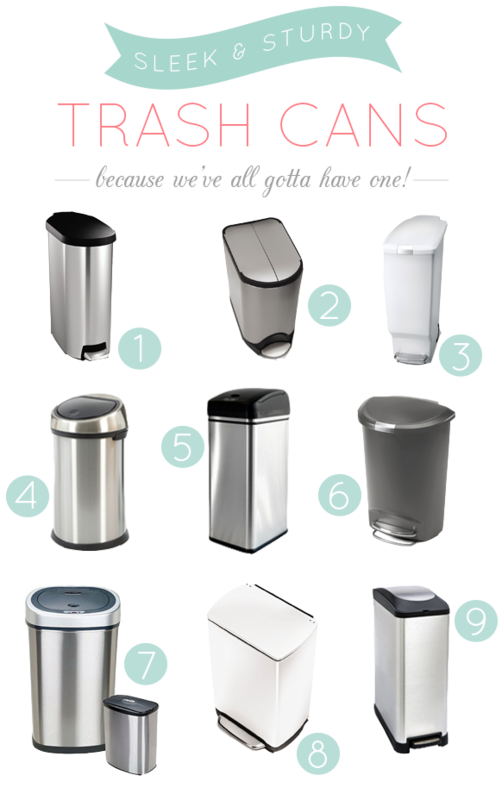 that have decent reviews and fit the specs above, but I'd really love to know if YOU have a trash can you love, and if you paid a nice chunk of change for it, was it worth it? Find a bargain one that does the job just fine? Any bad experiences with any particular ones? Help! ***Update! We went with #8 above. My sweet mom gave it to us as a housewarming gift :). I'm really happy with the way it's been functioning (we've had it for several months now) and I love the clean look of the white metal. Yikes! I feel your pain. Such an off-the-wall topic - but definitely an important one, especially when you're left needing one! Looks like #7 or #9 would be your best bets, price and space wise? A few years ago I went on the (Craigslist) hunt looking for a cabinet big enough to put my trash can into because I couldn't stand having it out in the open. I found a good size jelly cabinet for $25 that was a nightmare to get into the backseat of my car (even more of one to get it out by myself!). Once I demolished out the middle (built in) shelf and put in my trash can, I had room to fit the shelf above and there I store trash bags and swiffer pads and a couple other small cleaning things. The only problem was, once it was in place, it was literally blocking the stove door from opening - by literally a quarter of an inch or less! I ended up having to take the door off of it to allow the stove to open. I now have a piece of fabric on a tension rod that blocks off the opening which works just fine and looks kind of cute! Bonus is that I put my microwave on top which helped clear up some very much needed counter space (I'm sure you know that feeling too). Good luck, can't wait to see what you choose. Enjoying watching the new place transformation! Have fun and look forward to seeing more! :) Cheers from Rhode Island! Wow, Jamie Lynn! That's awesome. What a crazy adventure getting that jelly cabinet set up! Sounds like you found the perfect solution for your space though - I'm sure it looks awesome! Since I don't like the looks of any trash can, I use a wicker one that is probably a laundry basket with a lid. I put a kitchen trashbag inside. Yes, I have to remove the lid to put something in it. It's just my hubby and me, so it's no big deal. It's dark stained, like my kitchen table. I have a place at the end of my counter/cabinet area that it fits nicely..... And this is how I resolved the trashcan in the kitchen dilemma!! Good luck! Isn't that smart! If you've gotta have a bin somewhere, at least yours sounds pretty!